The Microsoft Dynamics NAV 2016 architecture comprises three core components as well as various additional tools and components. This three-tire architecture was introduced with the Microsoft Dynamics NAV 2009. With this architecture, the data and data manipulation layers are put on their own servers, the application logic is put on its own server, and the presentation and presentation logic are put on the client. If you deploy Microsoft Dynamics NAV in a multitenant deployment architecture, the data tier consists of an application database and one or more tenant databases. You can have multiple instances of any of the core components in a production environment. 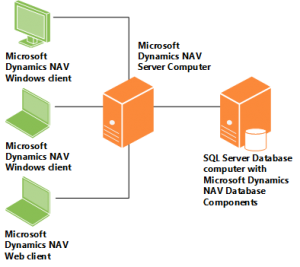 The attached diagram shows a simple installation with two Microsoft Dynamics NAV Windows clients and a Microsoft Dynamics NAV Web client connecting to a single Microsoft Dynamics NAV Server computer, which in turn connects to a computer with SQL Server and the Microsoft Dynamics NAV database components.